'Globalization' is one of the key concepts of our time. It is used by both the right and the left as the cornerstone of their analysis of the international economy and polity. In both political and academic discussions, the assumption is commonly made that the process of economic globalization is well under way and that this represents a qualitatively new stage in the development of international capitalism. But is there in fact such a thing as a genuinely global economy? Globalization in Question investigates this notion, providing a very different account of the international economy and stressing the possibilities for its continued and extended governance. The new edition of this best-selling text has been thoroughly revised and updated to take into account new issues which have become salient in the period since the first and second editions were published. Several new chapters have been added and others combined or re-written to assess the growing supra-national regionalization of the international economy, the emergence of India and China as new super-powers, and the possibilities for the continued governance of the global system. A new author has been added to strengthen the analytical embrace of the book given the untimely death of Paul Hirst in 2003. 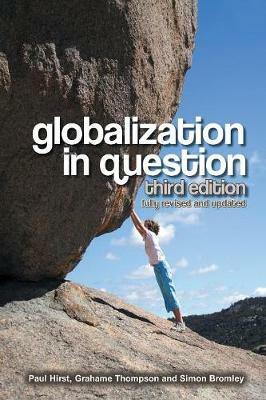 Globalization in Question, Third Edition, is a continuing intervention into current discussions about the nature and prospects of globalization. The book has far-reaching implications which will be of interest to students and academics in a number of disciplines including politics, sociology, economics and geography, as well as to journalists and policy-makers.